Kvatch, later found at The Flowing Bowl. 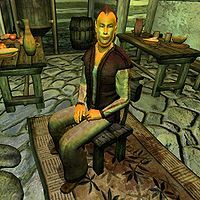 Hirtel is an Altmer commoner and a refugee from Kvatch. He is the first person you will encounter at the Kvatch refugee camp. He will inform you of the Daedra's attack, before promptly fleeing in wild panic. He wears a set of middle-class clothing: a brown shirt, a pair of light brown linens, and pigskin shoes. As he left his former home in a hurry, he carries nothing except a small amount of gold. When you arrive at the refugee camp south of Kvatch for the first time, Hirtel will actively seek you out and engage in conversation: "Come on! Run while there's still time! The Guard still holds the road, but it's only a matter of time before they're overwhelmed!" If you ask him for a reason, he will reply: "Gods' blood, you don't know, do you? Daedra overran Kvatch last night! There were glowing portals outside the walls! Gates to Oblivion itself! There was a huge creature... something out of a nightmare... came right over the walls... blasting fire. They swarmed around it... killing..." If you beg to differ, an insulted Hirtel will say: "Go and see for yourself! Kvatch is a smoking ruin! We're all that's left, do you understand me? Everyone else is dead!" When asked about how he managed to escape, he will point you towards Savlian Matius: "It was Savlian Matius... some of the other guards... helped some of us escape... they cut their way out, right through the city gates. Savlian says they can hold the road. No... no, I don't believe him. Nothing can stop them. If you'd seen it, you'd know... I'm getting out of here before it's too late! They'll be here any minute, I'm telling you. Run while you can!" If you manage to approach him again, he will add: "There's nothing left here for me. I'm getting out as soon as I can." Should you ask him about Brother Martin, he will reply: "I knew a priest named Martin once. I'm sure he's dead, just like the rest of them. They're all dead, don't you understand?" If you approach him after he arrives in Anvil but before the Kvatch gate is closed, he will say: "You can say what you like, but I'm never going back to Kvatch." After you have closed the gate, he will be a bit more optimistic: "You closed the gate? How did you do it? We can't thank you enough." He will then take off at a running pace down the Gold Road and run all the way to the Anvil dockside, where he will book himself in permanently at The Flowing Bowl. Once there, he will live a relaxed existence while waiting for the crisis to blow over. He will sleep in the upstairs area, in the second room on the left, between 2am and 6am and then just hang out all day long while chatting with the regulars and pirates that might stop by. He will eat a two hour lunch at midday and a two hour dinner at 6pm. Esta página foi modificada pela última vez à(s) 18h09min de 5 de janeiro de 2012.